I finally finished it. Getting back to still life with as little as I’ve shot since last summer (and such a small percentage of that planned table top) means I’m rusty right now. I have to make myself do this. The joy and fluency will return as I keep at it. But enough of my inner frustrated artist. The big, red dictionary was once my Uncle’s. I don’t know how it got to us, but whenever my Mom told me to look something up in the dictionary, this was the book I picked up. We had other dictionaries, but this was The Dictionary. Mom let me take it with me when I moved out. I’m not language crazy by any stretch of the imagination, but an old dictionary just has some kind of venerable aura about it. When I find one, I want it. This one from the 1950s was thrift-store find last fall. With its pinkish cover, letter tabs, and gold-edged pages, it almost looks like a Bible. Not all dictionaries are venerable tomes though. I found this pocket dictionary at a library book sale a few years back. The writing in the front cover tells me a teen girl owned it back in the 1940s. Speaking of old and venerable, I spent yesterday at an observatory constructed in 1895. In the early 1920s, it was such a big deal in astronomy and astrophysics that Albert Einstein himself visited it. Some of them just got here today, more are coming. This is an idea I’ve had for awhile, but I wasn’t sure how to pull it off. So here is my attempt at making a little forest out of books. It’s cold outside, so I’ve turned my attention back to indoor photography. 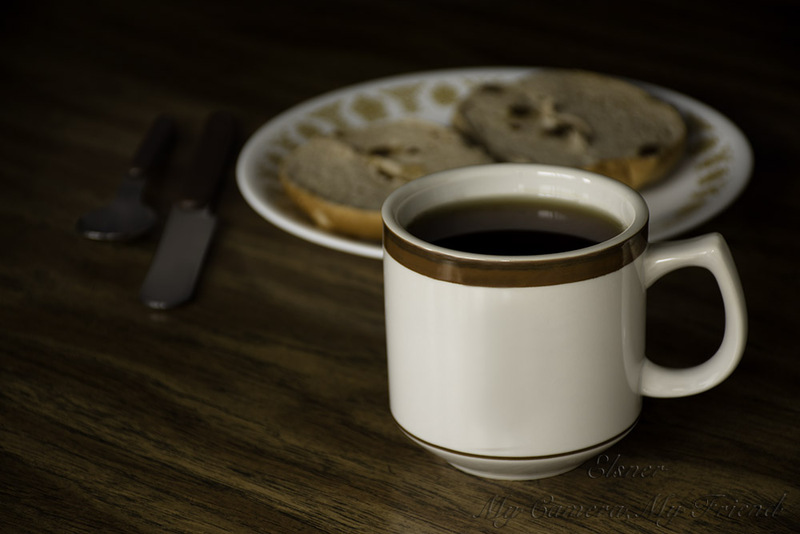 Mugs were a subject I’ve been thinking to shoot again, so I chose a couple and began dusting off my tabletop skills. This is a recent mug I bought for my father after I knocked another mug out of the cupboard on top of his old one and cracked it badly on the rim. Incase you think me extra clumsy, I was not the only person in the household to make that blunder. Someone else did it to my mug. Anyway, I owed Dad a new mug. It is sturdy and manly and not made in China, so he is satisfied. This is my mug. The very same one that was chipped just as I chipped my father’s former mug. I can’t fix it in real life, but I can Photoshop the chip. 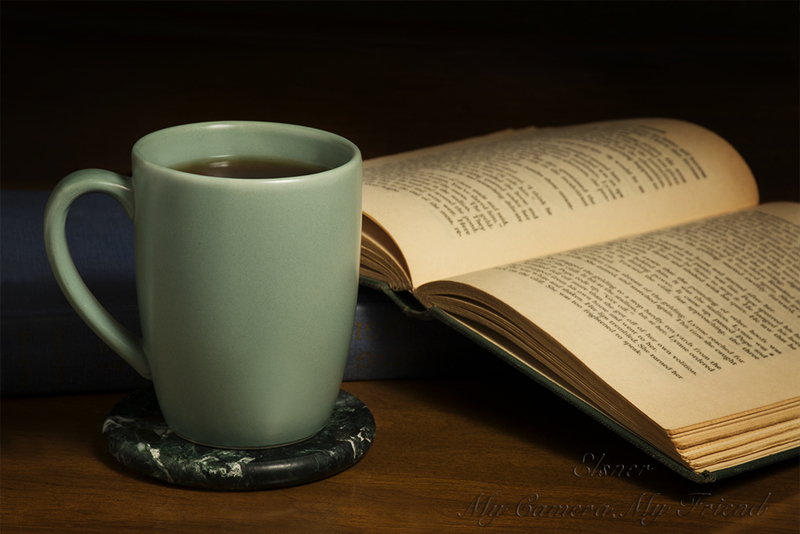 For this shot, I decided to leave the teabag in and use the base of an old lamp and a book for props. I am much more likely to blog or otherwise work on the computer while drinking tea than I would be to read a book, but the old book looks way better in a photo than my computer would. I’ll be photographing decorations or some other Christmas related items in honor of the season. My sister works for a small library that just kicked off a pet-themed summer reading program. 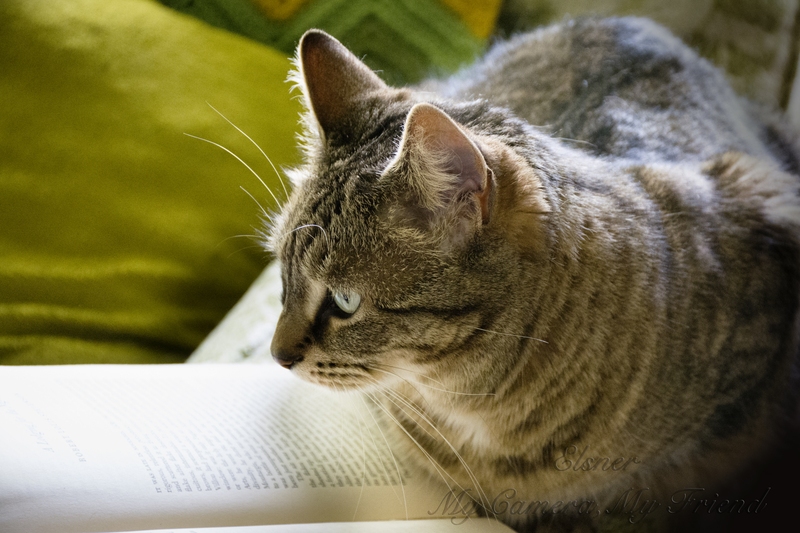 In honor of that, here are some photos of the cats with books. Yep, fresh catnip (and patience). The catnip was retouched out of the other photos. 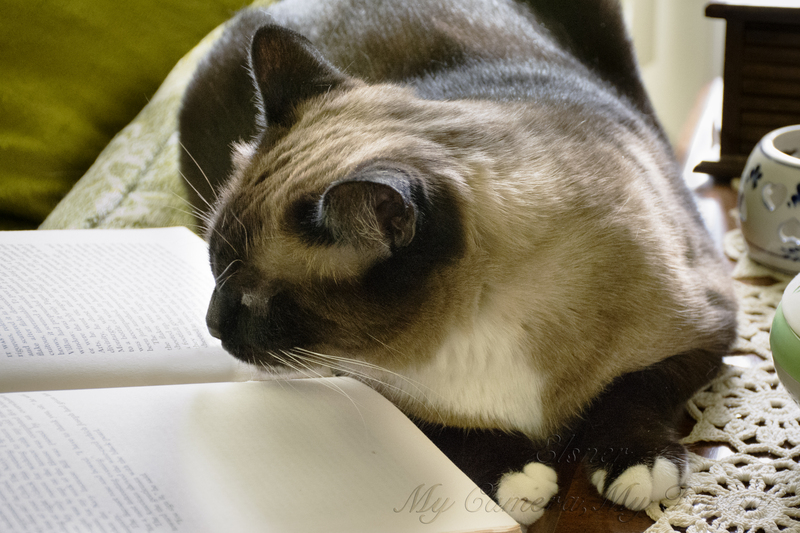 The cats moved, so I moved a book. Now they can read by the window. As you can tell, lighting and contrast were difficult in the last two photos. Local adjustments in Lightroom helped some. I first photographed vases back in January. Since there happen to be a lot of vases in the house, I decided to give it a try again. When it came to the first vase, I started with the color. I searched the house for another object of the same shade and found a little glass bird. I thought of the vase as a tree of sorts that would scatter seeds or flowers the bird might be interested in. Beads became my seeds in the glassworld. Kitty was very interested in the little blue shiny things. The second vase belonged to my great-aunt. 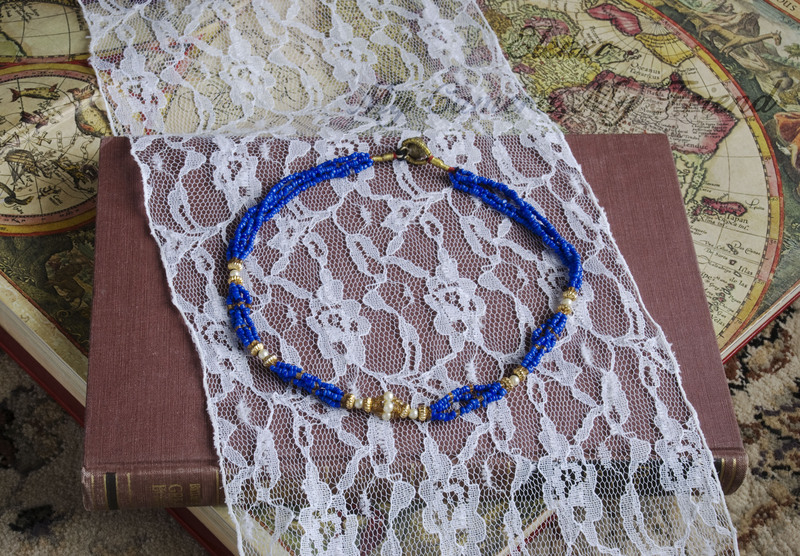 Because it is a family heirloom of sorts, I used a more traditional approach with older objects such as a doily and old books. I wanted the vase to look like it was sitting in an older couple’s livingroom. Last week, I was inspired by a catalog page featuring exotic large jewelry. Rooting through my things, I found a necklace a relative brought back from a trip and a letter “E” charm bracelet that fit the mood I was going for. Since I had a better idea of what I wanted to do with the bracelet, I started there. I went with the “E” theme, using an encyclopedia and a dictionary for props. At first, I thought about putting the bracelet on the cover of another encyclopedia, but the only nice encyclopedias available were red. It’s easy to overdo red, so I opted for the printed page from a dictionary, in the “E” section, of corse. When it came to finding props for the necklace, I searched the house for anything reminiscent of age, travel, or the east. I found this lovely old map artwork in the front of an atlas. The lace and red book just seemed to work well, but I’m going to have to force myself not to overuse them. I also used a muted brown “oriental” patterned rug for the shot. The cat gave me a really weird look when I grabbed it off the floor and toted it upstairs, proving that the nonhumans in the house find my photographic habits odd as well.